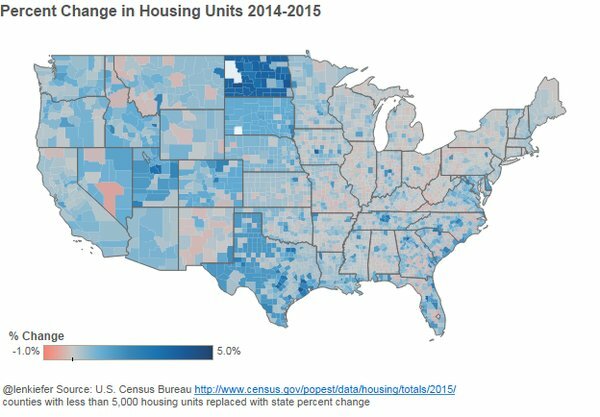 EARLIER THIS WEEK THE U.S. CENSUS BUREAU released data on population and housing units for counties across the U.S. in 2015. These data reveal important trends in population growth, and help shed light on recent house price trends. One key factor driving housing market dynamics is the expansion of housing supply (or lack thereof). The updated estimates from Census allow us to see which areas have added the most housing units and how that relates to population and house price trends. The map below shows the county-level percentage increase in total housing units for the lower 48 states*. *if the county had less than 5,000 units I substituted the state average. These data show the strongest growth in North Dakota, which grew at 3.5 percent from 2014 to 2015, and Texas. Growth was much slower in the Midwest and the Northeast. But that’s not too surprising since population growth has been weak in those regions. How does housing unit growth compare to population growth? The interactive map below shows the housing unit growth/population growth ratio (2015 relative to 2010) by county. The redder (bluer) the map the greater the growth in population (housing) relative to population (housing). We can compare the rate of growth in house prices to the ratio of housing unit growth to population growth. We would expect that areas that have population growth exceeding expansion of the housing stock would tend to experience greater house price growth. The figure below compares the housing unit growth/population growth ratio for 2010 to 2015 to the (nominal) house price appreciation rate from 2010 to 2015 by large metro area. Here we see a fairly tight correlation between the housing unit growth/population growth ratio and house price appreciation. Areas with a housing unit growth/population growth ratio ratio less than 1 (shaded red above) tend to have stronger house price growth. These data help support a consistent narrative of recent house price trends. Demographic tailwinds are propelling housing markets and driving demand. Those markets with the strongest population growth experience stronger demand growth. Areas where housing supply has not kept pace with demand tend to have greater house price increases. A strong labor market and low mortgage interest rates will likely support continued demand growth, but will supply be able to pick up the pace? That remains to be seen.